Go ahead Luke, go and brush your shoulder off. I still get goosebumps when I think about it: the first time a fresh-from-the-barber Luke Skywalker showed up on Crait to save the Resistance in The Last Jedi. He looked great and he was ready to fight—and, of course, we eventually find out it’s all an illusion. In the pivotal scene, Luke Skywalker wasn’t real. He was a projection, sent to Crait using the Force in an act that helped the Jedi not just save the Resistance, but create a myth that will restore hope in the Galaxy. 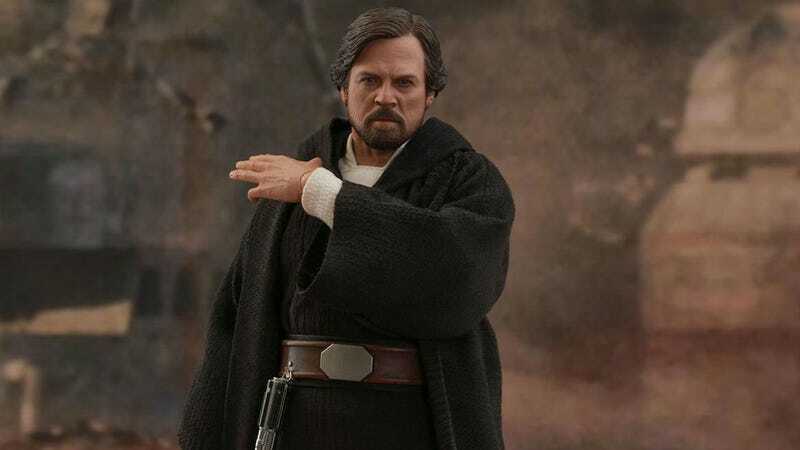 Almost a year after fans were treated to Rian Johnson’s awesome swerve in The Last Jedi, the Crait version of Luke Skywalker is finally becoming a reality. Something you can actually touch and shove a lightsaber though. Unfortunately, he’s still not flesh and blood. Instead, he’s plastic and cloth, in the form of Hot Toys’ latest creation, which debuted today on the company’s Facebook. Here are just a few of the images. Sure, this scene proved incredibly polarizing for some Star Wars fans, but to me, this is the definitive Luke look. It’s him finally embodying everything we wanted him to be, from the moment we saw him in A New Hope and especially after Return of the Jedi. We don’t even know if he ever really was this person, but it seems like in his mind, it’s the best version of himself. That’s why I love this look. Preorders haven’t begun as of publication, but will eventually be found at sideshowtoy.com, where the figure will probably go for between $200 and $250.